From the person who brought you the Chaotic Shiny generators, Chaotic Shiny Productions is dedicated to bringing you only the most awesome gaming supplements. We tailor our products for 4th Edition D&D because that's what we're playing now and that's what's in, but since we specialize in fluff, our books should have something to offer every game, no matter the system. Whether you're a DM or a player, you're sure to find something you can use in Chaotic Shiny Productions' products. If you sign up now, you'll get Trader Tables and Terror Tables, .pdfs full of dice tables in the style of Tavern Tables. You'll also get a preview of the entire Sijara chapter from Martial Flavor. 11/16/16: As is traditional, a NaNoWriMo discount! Use the discount code "NaNo2016" to get any of the generator packs in the store for only 99 cents. 10/30/15: It's been not quite a year, but I do have another free product available! The Character Generator is a standalone mini character gen for medieval fantasy characters, complete with a character portrait. 10/31/14: Happy Halloween! The NaNoWriMo Calendar has been updated to work for this year and any year! Also, there's a sale: for the month of November, use NaNo2014 to get 50% off any order of two or more products. It's like a buy-one-get-one-free deal with an extra 50% off everything else! 7/14/14: If you haven't seen them already, the Tavern Cards from the Kickstarter are publicly available! 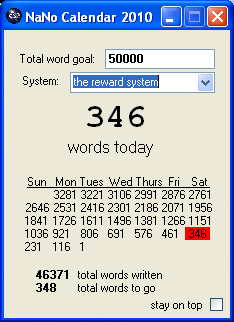 11/15/13: It's halfway through NaNoWriMo! Do you know what that means? It means the "halfway through NaNo half off" sale at Chaotic Shiny Productions! Use the discount code NaNo2013CB to get 50% off the Character Builder Generator Pack, and NaNo2013WT to get 50% off Writer Tools. The best time to buy generators is before the start of NaNo, but the second-best time is now. The sale is only good through the end of NaNo, so you'd better hurry. 7/12/13: The Kickstarter campaign has been keeping me busy, but I've broken free long enough to release not one, but two new products! There's the much-requested Magic Generator Pack, as well as the free Face Generator. Go check them both out! 3/17/13: Announcing Chaotic Shiny Productions' first actual physical hardcopy product, the Rune Cards. While learning how DriveThruCards worked for the Tavern Cards (which succeeded, by the way) I got the inspiration for a deck of cards to help people learn the Elder Futhark runes. Use it for learning, for game ideas, for whatever! Also, take a look at the new free PDF of Paladin Codes. 1/17/13: Very exciting news! Chaotic Shiny is running its first KickStarter! Check out Tavern Cards, the deck of playing cards that lets you generate a tavern, then win at poker while you're there. It won't be running long, so grab a deck while you can. 11/16/12: A new freebie for all of you, the Random Compass answers questions like, "Where's the nearest town?" and "Where's that noise coming from?" Also, the newsletter subscribers all just got a coupon for a huge discount on everything. I'm letting the rest of you know so that you know what you're missing. 10/13/12: At long last, the Writer Tools Generator Pack is done! Need to break out of a rut, want some inspiration or motivation, or just want to entertain yourself for a few minutes? The Writer Tools Generator Pack has something for you. 8/5/12: Been a while, huh? I'm still working on the Writer Pack, but meanwhile, there's another freebie: the Rune Spinner. Also, go over to Chaotic Shiny and check out the Random Encounter3 Contest for a chance to win some cool prizes. 2/15/12: Another small freebie, I hope that the Opinion Generator Portable will give you a taste of what you're missing out on if you haven't bought the Character Builder Generator Pack. Enjoy! 1/11/12: As those of you who've bought something recently have noticed, I'm giving out random short pdfs and mini-gens to people who give me feedback on the paid products. To give the rest of you a taste of what those things look like, enjoy the free Problem Mini-Gen.
12/7/11: A brand new product, and an experiment - the Puzzle Converter is pay what you want. Ever wanted a pretty puzzle to drop into your game? Go check it out. 11/16/11: A couple of great reviews of the Character Builder up, for anyone who was on the fence. 11/10/11: How's NaNo going, everyone? A couple small things - the first review of the Character Builder is up. Also, now there's a nice clean-looking Store Page in case you want to just give me money without having to read all those tedious words that are on the Products page. 10/28/11: Do you run a game or write stories involving characters? If you answered no to that question, you are probably lying. If you answered yes, you want the Character Builder Generator Pack, which solves all of your problems forever. And if you have any problems left, download the Free NaNoWriMo Calendar App so you know exactly how much you have to freak out each day for the next month. 9/5/11: Another great review of the City Pack over at Stargazer's World. If you haven't already picked up a copy, go read the review. And if you have a copy already, read the review anyway and smile to yourself about what a savvy consumer you are. 9/2/11: Two new exciting products for you! The first book in the systemless Arcane Cultures series, the Valok, is now available! Want evil bards in your game? You know you do. And as if that isn't enough, the second book, Cailleath, is out and it is free! If you've been wondering if the Cultures books are for you, wonder no more - you can now check out one risk free. 8/29/11: Just got a great review of the City Builder over at NEUROGLYPH Games. If you were on the fence about the generator pack, go read the review! 7/26/11: Look! A free thing! Go grab the Terrain Inspiration Generator and never again have to draw and fill in a grid yourself. 7/21/11: A great new review of MC: the Sijara is up at Life and Times of a Philippine Gamer. 6/29/11: Remember when I asked you all what generator pack you wanted next? Because I do, and that's why I've created the City Builder Generator Pack! It has a few favourite gens from Chaotic Shiny, as well as some truly outstanding new gens including the Rumor Generator. Go check it out! 3/17/11: The long-awaited Arcane Flavor is finally out! I think it's awesome and worth the wait, but don't take my word for it; take this guy's word. And then go buy the book. 2/19/11: Whoah, it's been a while, hasn't it? That's what I get for trying to take on too many projects at once - a lot of things that are almost done, and nothing to release. Don't worry; there's new stuff on the way soon. And to tide you over, here's an interview with me over at Game Knight Reviews. 10/28/10: Happy Halloween! A fun new freebie for all of you, the Zombie Generator Portable generates descriptions and pictures of zombies. There's also the NaNoWriMo Calendar 2010 for all of you doing National Novel Writing Month who want a convenient app to tell you how many words to write each day based on your goal and system. Here's a screenshot: NaNo Calendar. In further exciting news, Nov 1 will be the one year anniversary for Chaotic Shiny Productions! I'll be out of town all weekend, so no celebrations; but hey, shouldn't two freebies be enough? 10/21/10: A new reviewer is in town, Game Knight Reviews, and one of his first reviews is of Martial Flavor. Go read the review, then check out the rest of the blog! 9/30/10: Another fantastic review of the KBII is up on ENWorld. 9/21/10: Another fantastic review of the KBII is up at Gothridge Manor. 9/17/10: A great review of the Kingdom Builder II went up at Dice Monkey earlier this week. 8/29/10: The Kingdom Builder II is now released! Generate kingdoms full of hooks, plus laws, armies, fashions, and more. Also, thanks to everyone who sent in suggestions for the Suggestion Contest - you'll be seeing more than a few of them in upcoming products and generators. 8/5/10: I'm hard at work perfecting the Kingdom Builder II, with a bunch of brand new gens, including some suggested by fans of the original Kingdom Builder. And speaking of suggestions, that's the theme of my new contest: the Suggestion Contest. Email me a suggestion for Chaotic Shiny Productions - anything from a product you'd like to see, someone you think I should collaborate with, a new newsletter feature, even another contest - and get entered to win a free copy of the Kingdom Builder II, plus any other prizes I feel like giving out. Every separate suggestion counts as a separate entry - but only if you number them; I don't want to try and figure out how many suggestions are in a paragraph of ideas. I'll draw one winner randomly, and pick another one out of my favourites. And if there's enough cool suggestions, who knows what you could win? Maybe a custom generator pack made just for you. Contest runs through 8/20/10. 6/26/10: The Martial Cultures series has almost wrapped up now with the release of MC: The Daikort Pack. I had a lot of fun with this book - there's not only more cool stuff about the Daikort, but information on a dozen other organizations they interact with, all of which could easily find a place in your campaign. In other happy news, Newbie DM posted a favorable mini-review of the Treasure Hoard pack late last week. 6/15/10: Another great review of the Treasure Hoard is up at Neuroglyph Games. I've also just completed my move across the country, so more frequent updates (including some awesome new products) will resume shortly. 5/19/10: A fun new freebie for all of you, Rachel has put together some great art from the upcoming Arcane Flavor book (coming out this summer) into an awesome wallpaper. Check it out here. 5/5/10: A fantastic review of MC:Ikanoi went up today over at NEUROGLYPH Games. 4/25/10: A glowing review of the Treasure Hoard is up today at Gothridge Manor. 4/19/10: A bunch of exciting news today! There's another freebie, 10 Fantasy Coins, out to celebrate the release of our newest product, the Treasure Hoard Generator Pack. Newsletter subscribers have been getting sneak peeks of this for weeks; most reactions are along the lines of, "that's awesome." Also, Chaotic Shiny Productions is co-sponsoring Nevermet Press's Monster MashUp Contest. Describe the monster for a chance to win a copy of Martial Flavor and other awesome prizes, and maybe even see your name in print. All entrants get a 25% off coupon for Martial Flavor and several other cool things, so what's stopping you? 4/10/10: A new freebie for all of you, 10 Region Maps has five each player maps and DM maps describing all the exciting things going on in five original regions. Drop them into your game, use them as inspiration, or just look at the pretty pictures. 4/6/10: Another great review of Martial Flavor earlier this week by the acclaimed NewbieDM. 3/26/10: A free, fun little product for all of you: the Damager rolls damage for you, describes your attacks, and more. Also, check out the interview I did last week on the RPG Circus podcast. 3/16/10: Martial Cultures: the Ikanoi is now available! The people of ice and legend were a big favourite out of the orignal five from Martial Flavor, and they finally have their own book. Tons of new fluff, a little new crunch, extra art and some original fiction. Go check it out! 3/14/10: A great review of the Kingdom Builder at Spirits of Eden earlier this week. And happy pi day to all! Keep checking back for some more news later this week. 2/16/10: Announcing the official release of the Kingdom Builder Generator Pack! The first of many generator packs to come, the Kingdom Builder includes half a dozen generators, plus a graphical map generator. There's already a couple of great pre-release reviews up, so go take a look! 2/3/10: Whatever could this be? Looks complicated. 1/30/10: Some fantastic reviews have been rolling in over the past few days, including one of MC: Arytis, plus a couple more about some of our free products. Go check them out on the Reviews page! 1/27/10: We all love free products, but people have been asking me when the rest of the Martial Cultures books would come out. I can't tell you about all of them, but here's one answer: now. 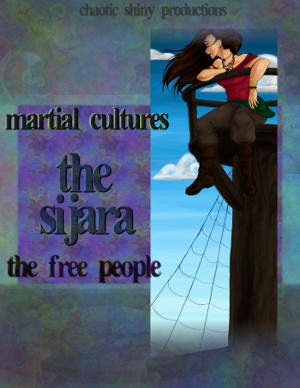 Martial Cultures: The Sijara is now available! If you like the Sijara in the free preview that comes with the newsletter, buy MC: The Sijara for even more alternate class features, feats, and flavor! 1/21/10: Another free product for all of you, this one an application instead of a pdf - the Pantheon Generator Portable. Generate unique pantheons with the click of a button, then edit the results, print them, or save them to a file. Look forward to some more generator packs coming out in the future. 1/12/10: Starting off the new year right with a great review of Martial Flavor from Dice Monkey earlier this week. Go check it out, and while you're there, stay for the excellent articles. And as of today, you can also find our products at RPGNow. 1/1/10: Happy New Year! Chaotic Shiny Productions isn't yet a year old, but in the time it's been around, I've learned a lot. One of the things I've learned is that my orignal business plan is not going to work. Reviewers and fans have spoken, and they've all said the same thing: lower your prices. So I am. As part of the New Year, New Plan initiative, I am drastically lowering prices - Martial Flavor is now only $14.95, and the Martial Cultures books will each be only $4.95. That's an entire culture for less than five dollars, or five cultures for less than three dollars each! So what are you waiting for? It's a new year; help make this new plan a success. And by the way, if you've already bought one of our products, check your email; there's a discount coupon waiting there for the price difference. 12/31/09: Two excellent new Reviews of Martial Flavor in the past couple days. And stay tuned for some exciting news on New Year's Day! 12/24/09: Happy holidays, everyone! My holiday gift to you is a brand new free product: 5 Minute Mini-Games. The fighter's asking the DM questions about his enchanted sword again and you've nothing to do? Play some Shocking Stones! The rogue is off doing whatever it is she does and no one's paying attention to the rest of you? It's a perfect time for a quick game of Rockball! Keep players entertained, challenge each other's characters, or face off against NPCs in any d20 system with 5 Minute Mini-Games. 12/15/09: Martial Cultures: Arytis is now out! Drop the martial city of Arytis into your game, or play a character who came from the city. New crunch, tons of new fluff, and even a city map. 12/6/09: The release date for Martial Cultures: Arytis is now set: December 15th. You can see the cover of the book up on the product page now, and the covers for MC: The Sijara and MC: The Ikanoi are also now up. 11/27/09: A new review of Martial Flavor is up, from Wyatt of Spirits of Eden. You can check out all the reviews so far for any product on the Reviews page. 11/18/09: Major site redesign! Hopefully this new design should help you find what you're looking for more easily while looking prettier. If you find anything broken or have any comments, Let me know. 11/16/09: Some updates to the product page for Martial Flavor, plus an announcement: if you sign up for the newsletter, you can get free! If you've been wondering if you should sign up, or wondering what's so awesome about Martial Flavor, now is the time to take action! Sign up for the newsletter and see for yourself. 11/1/09: It's the big day: Martial Flavor is now available! If you buy it before November 17th (which happens to be my 21st birthday) you get a free bonus. So what are you waiting for? 10/28/09: Continuing with the previews in the run-up the release, I am happy to announce that Martial Flavor will come with power cards! There's some examples up on the product page. 10/27/09: The cover of Martial Flavor is now up on the product page. Want to see what this book looks like? Go check it out! I've also updated the example pages with some of the small changes that have been made since they were first posted. 10/22/09: Exciting news! The first review of Martial Flavor is now up, over at Dungeon Brew. You can read it here. 10/20/09: With the release date for Martial Flavor on the way, I thought it was about time to start getting professional around here. Chaotic Shiny Productions now has its own domain name, http://chaoticshinyproductions.com. Update your bookmarks! All the old urls should redirect here - if you find a glitch somewhere, let me know. You might also notice a few more product pages springing up around here. That's my way of letting you know I'm not some fly-by-night swindler who's going to vanish after giving you one good book. Chaotic Shiny Productions is here to stay, and if you buy and enjoy Martial Flavor, you can look forward to more like it on the way. 10/16/09: Exciting news! Finally a release date for Martial Flavor: November 1st! Mark your calendars, and then come and buy the book. There's also some new excerpts up, including the first page of the Ikanoi section which includes some of the gorgeous full-color art you can expect inside of Martial Flavor. 9/22/09: I put up some design notes for Martial Flavor on the product page. Things are progressing well, with the layout nearly done and the art coming along as well. 9/11/09: Sample pages are now up from all three of the cultures featured in the excerpts: Daikort, Sijara and Elessim. This is probably what the final copy will look like, though it's not set in stone.